Recently, after the following article surfaced talking about NASA’s effort with Warp Drive, I received several questions regarding the technology and if NASA was really that close to its development. The wide interest has prompted me to provide a response to all. A NASA scientist claims to be on the verge of faster-than-light travel: is he for real? Clearly the PopSci article comes across as more whiz-bang, technology-enabling, new era of space travel, a fair bit of ego stroking, with little discussion on the likelihood of true success. While there are other versions of that article and announcement that provide more of a balanced view, I wanted to highlight this one due to its popularity and far-reaching consumption. I do want to be very clear in saying I’m whole-heartedly behind White’s efforts and praise his ability to secure funds for a project that is not part of NASA’s current mission portfolio in this very arid budgetary environment. However, today I advise restrained optimism, and hope to put things in perspective; first to temper one’s expectations in our world of instant gratification, and second, when NASA isn’t warping us around the galaxy in five year’s time, NASA isn’t brow-beaten as a waste of tax-payer’s dollars. In all fairness, White’s testing is barely in the Proof of Concept phase. And clearly since there is no program or directive for NASA to do this work, then he is doing this on a shoe-string budget that has been scraped by the center to give him some “investigation dollars”. In my opinion, that alone is a significant achievement! When dollars are being taken away from the program that supports maintaining the astronaut’s health for the space station, I find it amazing that somehow he is able to receive money to develop such a fantastical technology. I have said for many years that the single most important technology we as NASA, or the human race, should develop is propulsion technology that far exceeds our current capabilities. When it takes several months, one way, just to reach our closest planet that is remotely habitable, it drives all sorts of design issues that make it not only very difficult to conceptualize, but very, very expensive. The inordinate amount of time spent in transit requires multiple levels of redundancy in safety systems, incredibly high mean time between failure (MTBF) capabilities in your systems—which in itself is very difficult to convince yourself when you only have enough money to build a prototype and the final vehicle. Then there is the trade between redundant systems and keeping the overall mass low enough to get onto whatever rocket you have available to get the vehicle—or pieces of the vehicle off of the surface of Earth—lest you have to incur more expense by developing an entirely new launch vehicle. Then there are the provisions for water, food and air for the crew for the entire trip, which in turn drives the technology to recycle as much air and water as possible, which in turn drives complexity of the system, propensity for failure and geometric cost growth. And while not last on the list, you have to take into consideration your propulsion technology and required fuel. Our current capability of solid and liquid rockets, using primarily hydrogen and oxygen, require the vast majority of the overall vehicle weight—generally +80%—just to address the required fuel, fuel tanks, pumps and pluming. However, if you could shorten the trip time to Mars, for example, to just a month each way or less, then most all of what I have stated before are OBE (overcome by events) as we say at work. If you can get there in a month then you do not need to worry with a lot of the failure scenarios and contingency plans. They will only be traveling in space for just a month each way requiring one sixth the consumables required for humans and if something were to go wrong, you only need them to be able to survive for a month before the rescue vehicle arrived from Earth. With current technology and cost of vehicle construction, if something were to happen on the way to Mars and they were not able to return to Earth, they would be on their own to survive for years, waiting for another vehicle to be built and sent, if at all. So yes, having a paradigm shift in the propulsion technology is not only required for us to do any meaningful exploration, but in order to make it cost effective. Even if faster-than-light propulsion is not possible, just by developing a system that approaches the speed of light would be a marked improvement in reduction of overall design complexity and associated costs. Now to appropriately set people’s expectations. Despite what you see on TV and what Edison was capable of doing in his lab by himself or with a few assistants, it is not possible to design the technology that warps the very fabric of the space-time continuum in a small lab funded on a shoe-string budget. Plain and simple. Sorry to say it, but that’s reality. The days of one person developing a game-changing capability are long past simply due to the resources involved and pushing the boundaries of technology and physics. In our history we were able to build things like telescopes that do not require a standing army. But even telescopes have moved into the realm of complexity and cost which are well beyond what one person can do or afford: see any of the large planetary or space-based telescopes in the last forty years. So you might ask, “Why can’t we develop warp drive or something like ‘Mr. Fusion’ in the garage? Maybe I’m just a jaded government employee… ” Well, maybe I have my days, but I would argue that the best way to predict the future is to look into recent history. So, let’s look at what it took to develop the technology that we have been living with for the last 60+ years: Fission reactors (a.k.a. nuclear reactors/bombs—what have you). That’s right, 26 BILLION dollars and over one hundred thousand people just to split an atom which is something nature is inclined to do anyway—see the laws of entropy. So, let’s talk about doing something similar, but what nature doesn’t willingly want to do, except only in certain situations like the Sun: Atomic Fusion. In general, you are fighting all of the strong and weak forces associated with atomic and subatomic forces, but in the case of the Sun, the intense gravity and associated heat and pressure allow it to occur. Yep, to make it happen on Earth, we have to re-create what is going on in the center of the Sun. Do we somehow think that a technology, such as warp drive, which is so radically different than those two examples is somehow going to be possible with a fraction of the effort and resources? Anyone remember “Cold fusion” from 1989? Two men, one lab, one beaker, a few bubbles…Enough said. 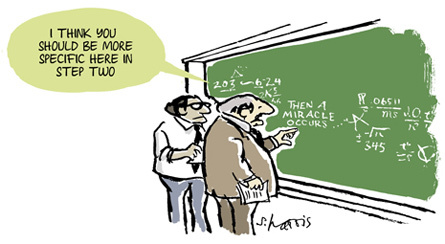 We’re all familiar with the cartoon “…then a miracle occurs…” that describes what many of us have experienced at work while making our project plans seem credible or while trying to get our masters or doctoral research to match our expected thesis results. But if we look back over the technological history of humankind, you don’t see these ‘beyond comprehension’ creations by our own hands. We see a lot of discoveries of naturally occurring phenomenon that were not created by us, just observed. Electricity? Well it existed before, we just learned how to conduct and control it. Penicillin? Again, that organism existed for a long time without our help; we just observed what it did to microbes. Fission? We didn’t invent it, we just learned how to make it happen when we wanted to and to some extent control the resulting release of energy. Warp Drive? Well, my suspicion is that if we are going to replicate or control what occurs naturally, we first have to understand gravity and/or the driving mechanisms behind worm-hole theory, and it will take a non-trivial amount of resources. In comparison, if it takes billions of dollars each year to try to develop a stable fusion reactor—which has been funded by some of the best minds in the world for the last 20+ years and having accepted and understood mathematics and physics—what is the likelihood of this gentleman and his one lab being that close to solving the problem of warping space with the pittance of funding he has received? My personal, semi-informed opinion, is if his funding and staffing profile doesn’t change, he will likely retire still trying to understand the actual mathematics involved in the unexpected results he will inevitably see, just to get his proof-of-concept to work. I reiterate, I fully support White’s efforts and hope beyond all measure that he is one day successful. But I also want to help temper people’s expectations such that the enormity of the problem is sufficiently framed so that expectations are realistic. As a tax payer, I want you to understand that it is way more complicated and expensive than you are being led to believe by the media. It is partly the media’s desire to sell you an exciting story that leads you to believe that you are only years away from living in the Star Trek universe. The other is the very sad reality of what engineers and scientist are required to do to build enough interest and excitement in order to secure the funding required for their work. 16 Responses to Warp Drive – Brought to you by … NASA? Per my comments above about funding for Warp Drive, perhaps Mr. Musk, and others like him, might be the answer. Wow, wonderful weblog layout! How lengthy have you ever been running a blog for? you make blogging look easy. The total glance of your web site is great, as smartly as the content! Oh, thank you so much! I can’t say that I find it easy. I try to write one a week, but sometimes life has other plans for me. My goal is to provide some added value to the internet and to help stir some interest and excitement the the sciences. Thanks again for your note and I hope to see you here again. Thank you for stopping by and dropping your note. Sorry to hear about the RSS feed. I’ll look into it on my end to see if you have been double book-kept. Sorry it has taken me so long to reply. I’m very glad you have enjoyed reading what I have posted here, and I appreciated the positive feedback! Please drop by from time to time to see what’s new. Hi there, Thanks for the note. The WP theme was just one that was available when I signed up for the account. I think if you look down at the bottom of the page, it will show the name of the theme to search for. Thank you for your note. I am unsure what to say as it shows up without any issue on my iPhone 4S. If you could provide more details, I might be able to address them. Thanks again, please continue to visit. Thank you for your kind words. I am in the final throughs of finishing my novel “In the Days of Humans: Third Exodus”, so my time to write articles is a bit limited right now. However, once I get it sent off to the editor, I should have more time to finish up a few that I have in the cue. I wish you well in your writing, and if it is only for yourself, I predict you will find it vastly satisfying. Excellent web site you have got here.. It’s hard to find quality writing like yours nowadays. I truly appreciate individuals like you! Take care!! I blog frequently and I genuinely thank you for your information. This great article has truly peaked my interest. I’m going to take a note of your site and keep checking for new details about once a week. I opted in for your RSS feed as well. Having read this I believed it was rather enlightening. I appreciate you taking the time and energy to put this information together. I once again find myself spending a lot of time both reading and leaving comments. But so what, it was still worthwhile!